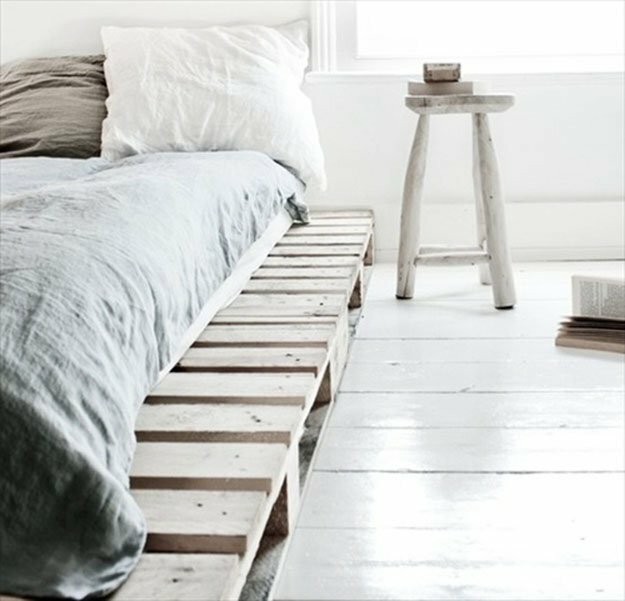 Today we have focused our attention on recycled pallet bed frames, a topic commonly encountered and of high interest among fellow drafters. Pallet wood is an infinite resource, filled with creative possibility and multiple functions. The number of pallet projects or areas where pallet wood proves to be useful grows larger with each passing day, filling in blanks left in the furniture industry and being re-adapted, reinterpreted and beautified in creative, imaginative ways. Whether we are talking about recycled pallet bed frames, outdoors patio furniture, pallet coffee tables, raised garden beds and so on, pallet wood is and should be recycled and up-cycled on a daily basis. "A pallet, sometimes inaccurately called a skid (a skid has no bottom deck boards), is a flat transport structure that supports goods in a stable fashion while being lifted by a forklift, pallet jack, front loader, work saver, or other jacking device, or a crane. A pallet is the structural foundation of a unit load which allows handling and storage efficiencies. Goods or shipping containers are often placed on a pallet secured with strapping, stretch wrap orshrink wrap and shipped. Since its invention in the twentieth century, its use has dramatically supplanted older forms of crating like the wooden box and the wooden barrel, as it works well with modern packaging like cardboard boxes and Intermodal containers commonly used for bulk shipping. While most pallets are wooden, pallets can also be made of plastic, metal, paper, and recycled materials. Each material has advantages and disadvantages relative to the others." The advantages of using the beautiful material of pallet wood are numerous: they are very easy to find , with healthy strong wood and sturdy structure, rather cheap, which makes them a wonderful alternative to other store available materials, not to mention the actual beauty of the wood, its intricate complex texture evoking the natural environment with all its small perfect imperfections, raw texture and multitude of varieties and tones.Pallets come in different sizes, offering numerous possibilities of interpretation and modification.They can be cut up to fir a tiny corner, the wood stripped and reused in creative projects, layered to form storing units or raised beds and so on. Imagination and patience is all that is required in the process. Left bare, in their raw shape, they would fit nay decor from the modern, contemporary ones where they will add a necessary contrast with other sleek pieces of furniture, to industrial raw environments where exposed brick walls and concrete floorings demand such a material to warm up the atmosphere. 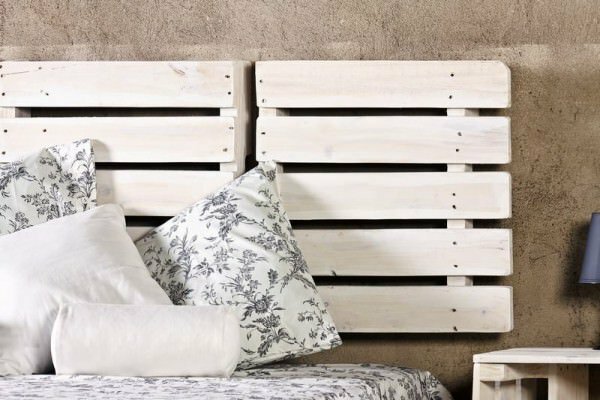 If chosen to be painted, pallets welcome neutral tones of white, beige, grey or even pastel tones that will fit perfectly a Scandinavian inspired decor. 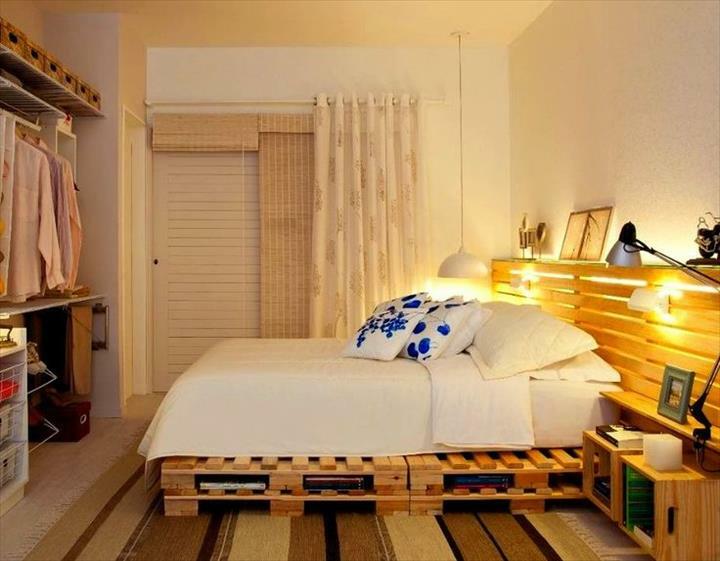 Choose to invest your creativity wisely and opt for pallet furniture. Notice how the natural tone of the wood exudes warmth and coziness into the room. The rest of the decor has been kept to neutral tones as well, letting the atmosphere to breath and not overwhelm it. A rather small bedroom requires storage space. 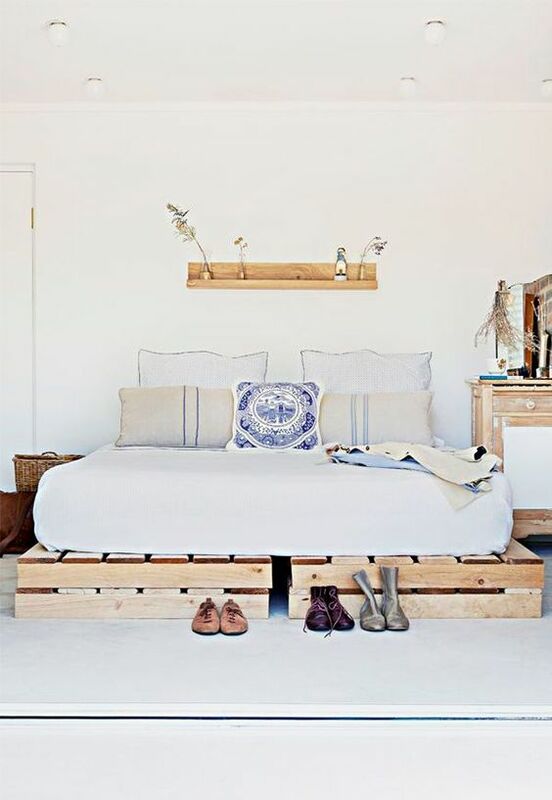 Here pallet wood has been used to create the bed headboard and floating nightstands. The space beneath the pallets themselves is being used as book and magazine storage. 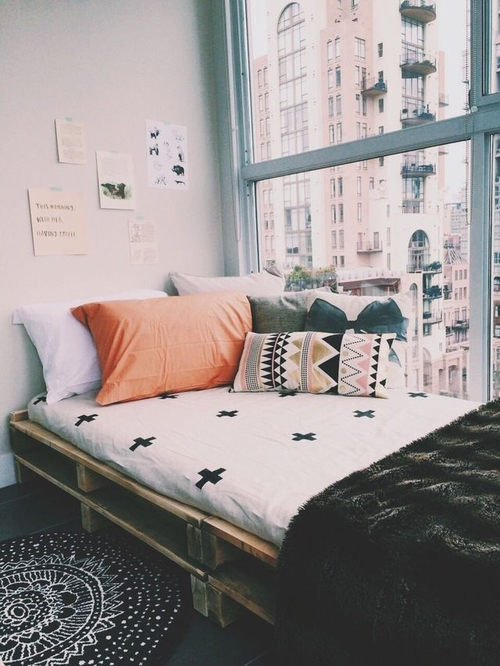 For a narrow bed placed near a large glazed wall overlooking the city line, pallets seem like the right smart choice. Cheap and versatile, don’t you think? Add a cozy holiday spirit to your bedroom by adorning your pallet bed frame with sparkling string lights. 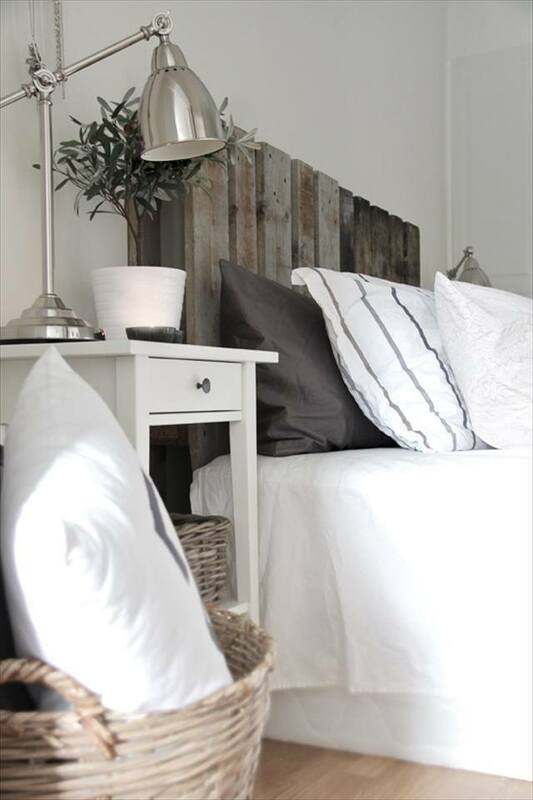 White works wonderfully on pallet wood, opening up any space and fitting perfectly into a small bedroom. 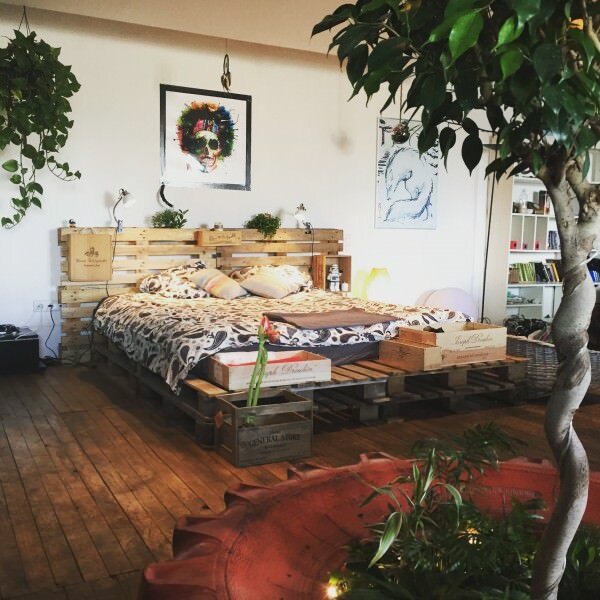 We love the mixture of pallet wood warm and cozy and the green fresh touch of nature. Wooden crates have been added to the decor to complete the image and store plants and pillows. 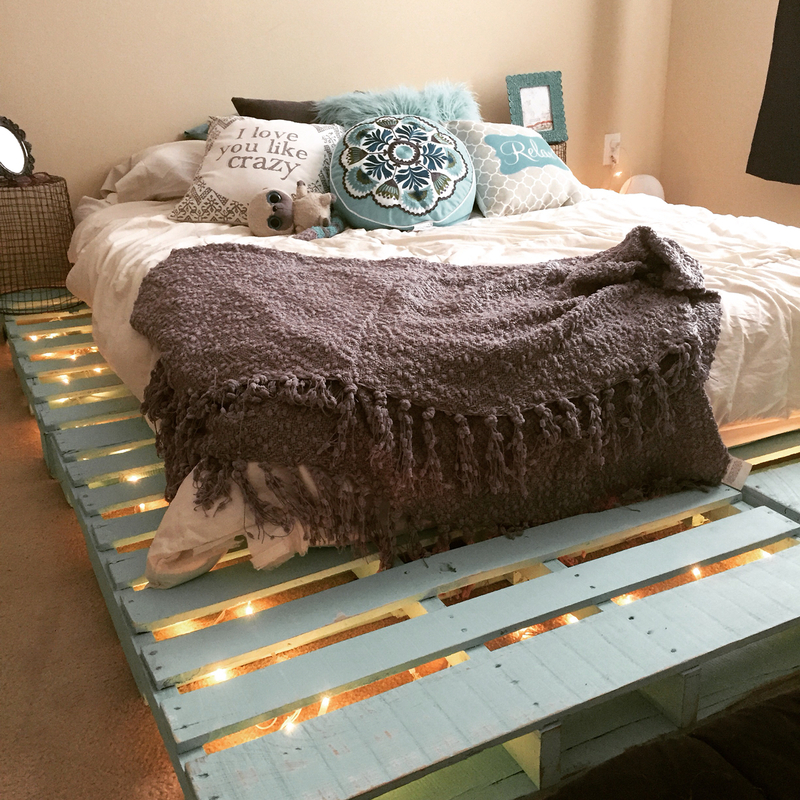 For a feminine touch this diyer chose to paint his pallet bed frame in a delicate turquoise tone that is here emphasized by the warm touch of string lights. Pallets have been deconstructed and their wood used to build a simple yet elegant bed frame decorated with feminine pink bed covers. 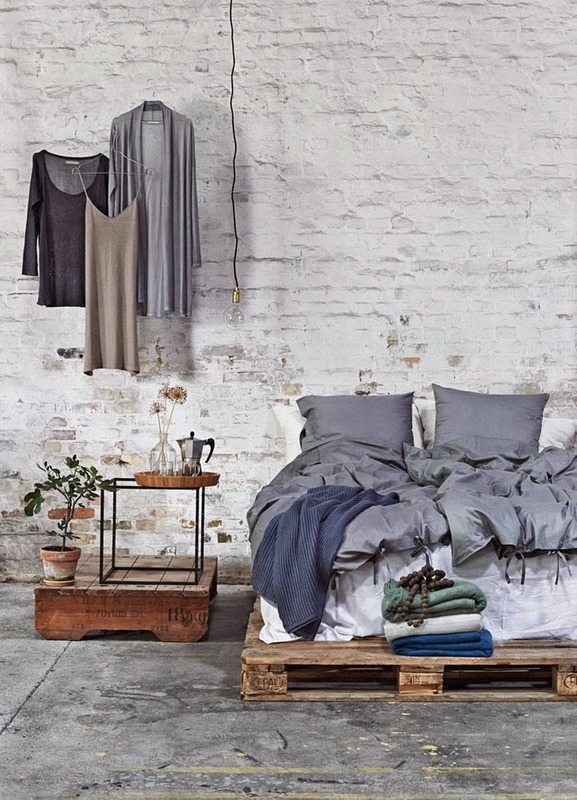 The simplest of designs, featuring a single layer of pallets nestling a rather comfortable mattress and warm fluffy bed covers. 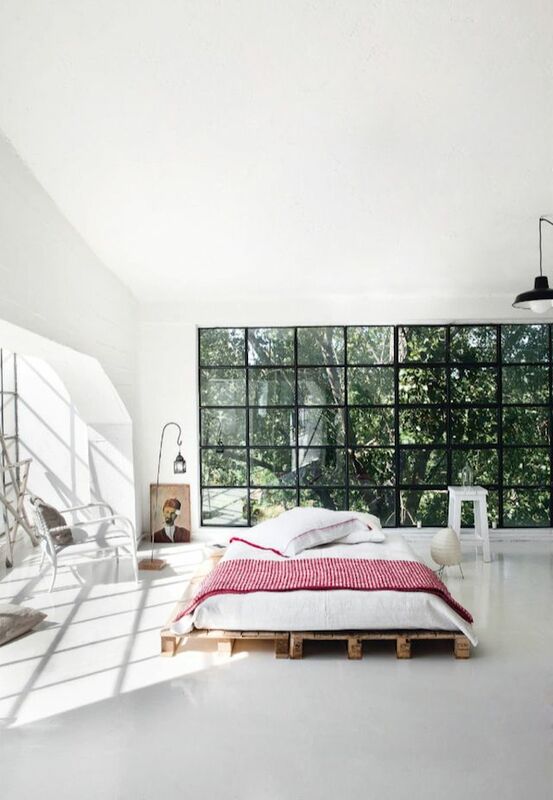 Large bedroom with huge glazed walls overlooking the natural environment should be let to breath, with as little furniture as possible.Here the pallet bed does just that, allowing the surroundings to trespass the physical limit and become part of the actual bedroom. We at Homesthetics have always found the Scandinavian style with its airy open neutral fresh style adorable and suitable for so many individuals. It is a spirit that allows you to feel cozy at home without overdoing it. 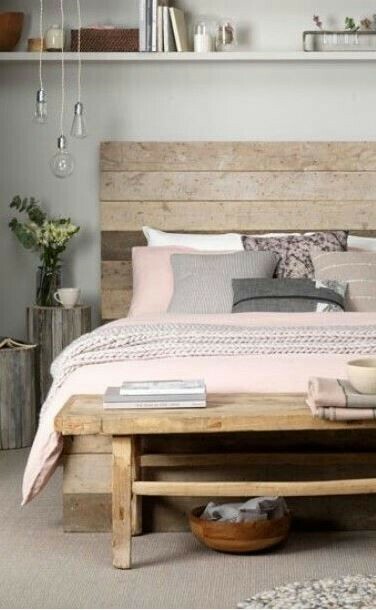 Here old pallets have become a beautiful rustic bed headboard emphasized by the stark white of the rest of the decor. Feeling cheerful and creative? Opt for bright toned bed frame that will raise your spirit each day. A narrow room with an exposed brick wall requires a light furniture, one hat will contrast the raw texture and intense rich tone of the wall itself. 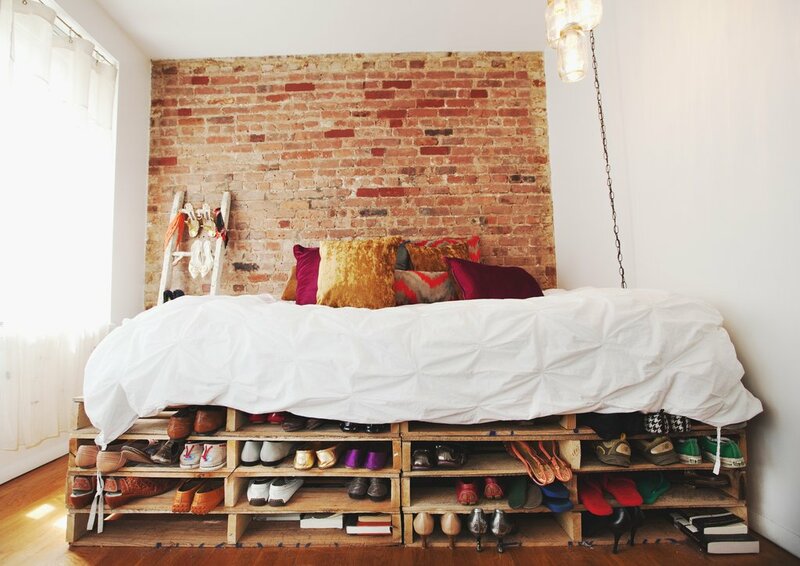 Choose a pallet bed frame adorned with white bed covers which can double as shoe storage as well. 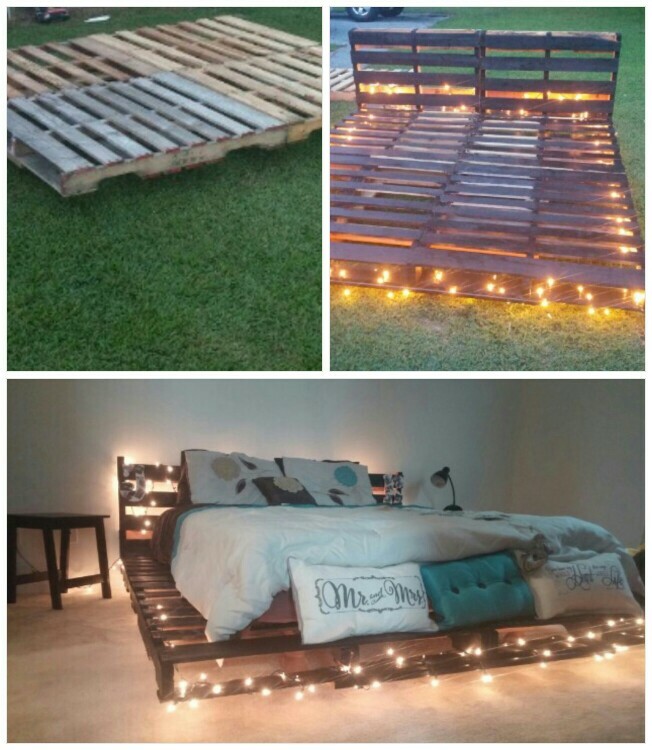 Pallet beds can exude a serious conservative atmosphere as well, even if at a first you would’t associate recycled pallets with such a style. Here perfectly cleaned pallets frame a simple bed adorned with elegant bed covers and pillows with delicate blue accents. 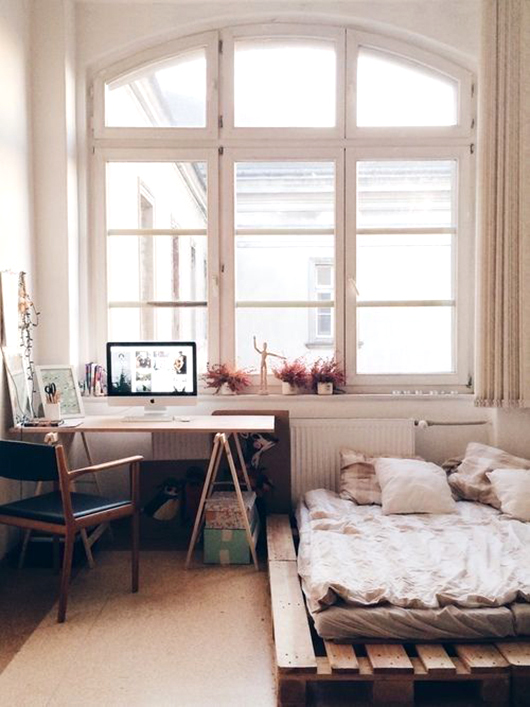 If you are a big fan of the Japanese style, improvise a low pallet bed frame, keep the decorations to a minimum and the tones neutral and obtain a relaxed bedroom style that will bring you closer to the earth’s energy. The industrial style adores raw insertions: exposed brick walls, concrete floors, pallet furniture, hanging wires and free lighting bulbs to illuminate the scene. Paint your pallet furniture all white and integrate it in an all white themed apartment with delicate lighting and fluffy cozy fabrics. 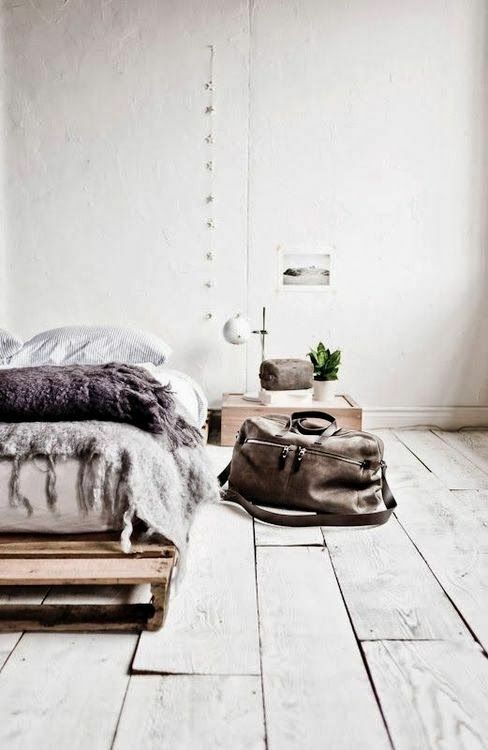 Wood, white and lots of natural light will define the perfect simple Scandinavian bedroom design. 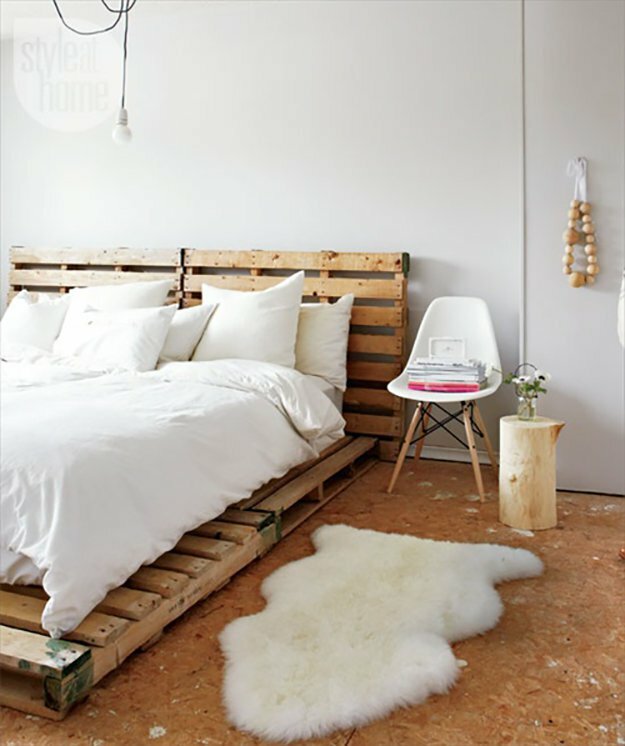 Another beuatiful example on how pallet wood can be integrated and transformed into a key element of a fresh airy bedroom. 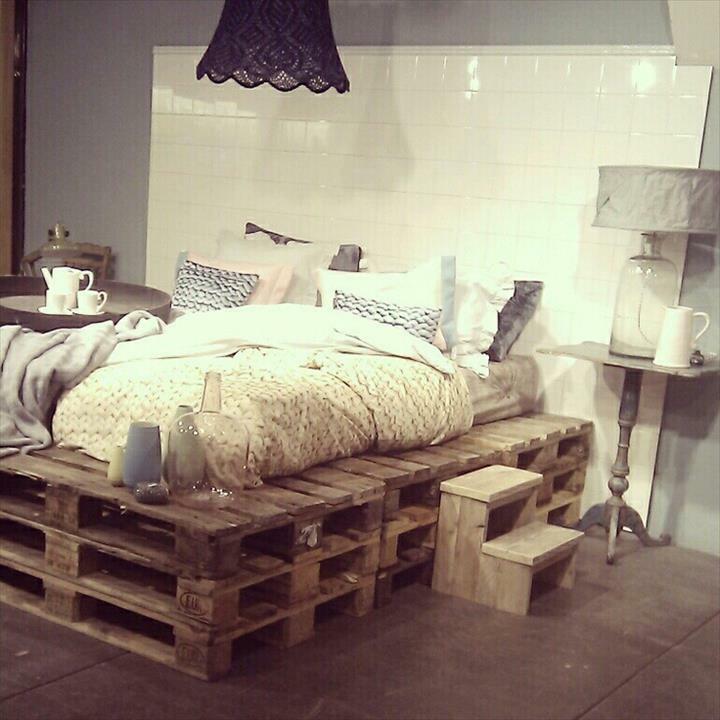 Small spaces can be quite tricky to furnish but pallet furniture can turn out to be the solution you were seeking for.